I always try for variety in my walks. Sometimes I have to look back to see where I’ve taken you, as was the case with Loulé . 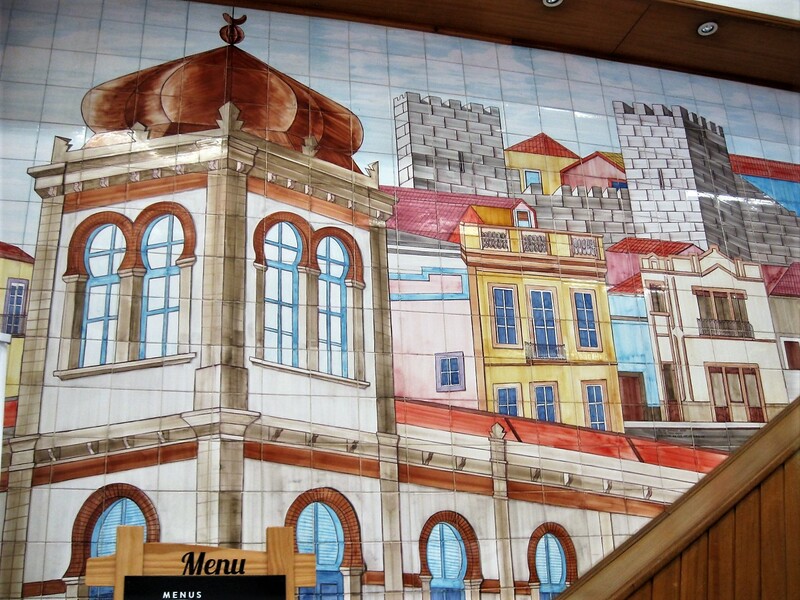 The attractive tile panel of the Arab market, shown above, was hidden away in a Pingo Doce supermarket. (I was looking for a birthday cake at the time, strangely enough) Loulé is one of those places you can go when the Algarve weather is not all that you might have hoped for. (yes, it happens! Though not often, in my experience.) There’s always something of interest to see and do there. Despite the urban sprawl, it has a rather elegant old quarter, resplendent with calçadas, so I’m sure my friend Madhu would enjoy it. Billowy panels fluttered above the streets, evidence that it had been consistently hot and sunny. 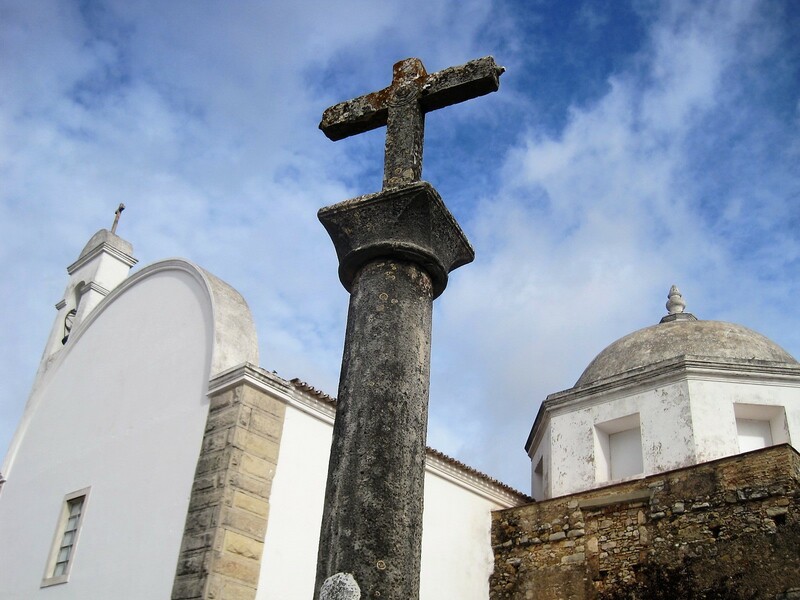 Meandering on Rua 5 de Outubro, I had an urge to go and see Nossa Senhora da Piedade. It’s an uphill climb to the church, but I think it’s worth it. For tethering a horse? Becky would know! As luck would have it, I was diverted before I could even begin my climb. A banner on the side of a church building proclaimed the closing days of an art exhibition, by João Garcia Miguel. A smile from the receptionist, just inside the doors of Convento de Santo Antonio, invited me inside. But what an extraordinary sight greeted my eyes. I’m afraid the art exhibition took second place. The central nave of the church had been restored, in a plain and simple style, while retaining the crumbly but beautiful arches and alcoves of the side chapel. I won’t dwell too long on Nossa Senhora da Piedade, as we’ve been there before, but I’m sure you can see the attraction. The tiny chapel was built in 1553, almost survived the earthquake of 1755, and has been restored in all its exquisite detail since then. Overshadowed by the huge dome of the 2oth century addition, you might never know this chapel exists, but it’s been bringing the crowds here for the Easter procession since the 16th century. I must have had my religious head on that day because, wandering back into town, I found myself drawn to Nossa Senhora da Conceição. Sitting in a quiet corner on Rua Paio Peres Correia, there’s often a queue outside this small chapel with its beautiful 18th century azulejos. I was lucky! So many riches in my walk today! I think we’ll just tootle past the bandstand and head for home. But, wait a minute! I’ve not treated you to cake lately, have I? Better put that right. Please, be my guest! Chocolate cake so, obviously, not mine! I hope you enjoyed returning with me to Loulé today. Next week I plan to take you to Cascais, on the Lisbon coast. A change is as good as a rest? Thanks so much for the lovely response I got last week. I’ve got some great walks to share, so let’s get that kettle on and settle in. Join me with a walk of your own any time. Details are on my Jo’s Monday walk page. Anabel starts us off with a walk around a delightful Scottish island I’d never even heard of! Cathy wanders in all sorts of fascinating places. Some day I’ll catch up! This week Jackie is being disgustingly lazy. I know- I’m jealous! And talking of weather, these seas look awfully cold, Drake! Woolly tells me that there are more than 2,500 Commonwealth War Grave cemeteries on the Western Front. So much sadness! Another sunny city that I’ve always wanted to see (and don’t miss the Transporter Bridge)- thanks Cadyluck Leedy! That’s it for another week. I have my last pre-Christmas walk with my walking group today, so I expect mince pies will follow. Thought you’d approve. 🙂 🙂 Not a morsel passed my lips. It was Mick’s. Hong Kong wil be exciting. Just home from Leeds. We took a sledge down for Logan but the snow still hadn’t arrived when we left. Disappointing for him, not so much for us. 🙂 🙂 It’s here now. Pretty in the dark but I’ll wait till tomorrow to venture out.